Gritty reboots are the in-thing for cinema these days. Man of Steel recently reforged the camp-as-Christmas-and-twice-as-festive Superman franchise into a love poem to fatalism and duty, the Christopher Nolan Batman films did away with such marvels as the Bat Credit Card (never leave home without it) and there's a similar trend in video games, with the latest Tomb Raider excursion being more a bit grimy. But what is to be done with a game already brutal and unforgiving? A game that for thirty or more years has been chewing people up and spitting them out? 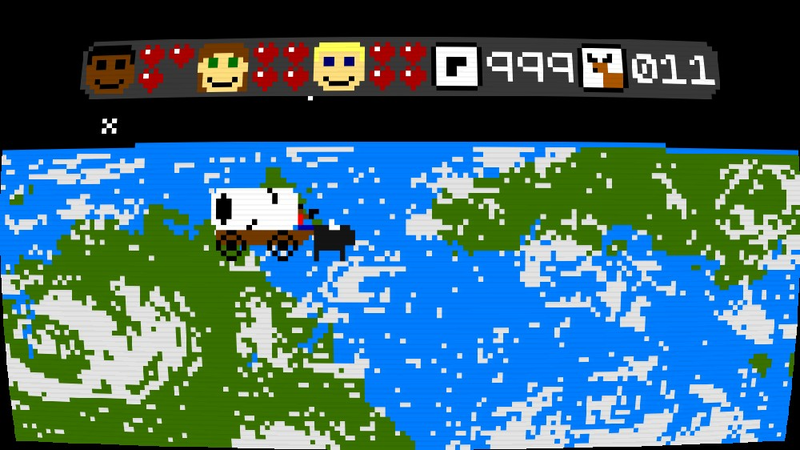 I speak of The Oregon Trail, the merciless edutainment game of watching settlers die horribly and uselessly. Often of dysentery. 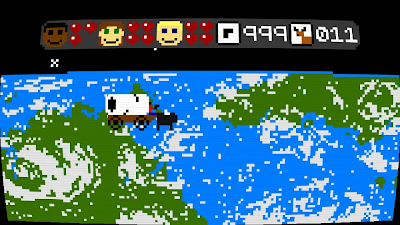 And the answer to the question is: go in the opposite direction and make a wagon-based migration game that is an absolutely unhinged and dirtily, filthily fun shoot-em-up. Welcome to the stage of history, colonist. This is Super Amazing Wagon Adventure. This is How The West Was FUN. Let's get edutained! This game is a stone cold delight which had this grown 30 year old man clapping his hands like a giddy child as he machine gunned burning buffalo from a unicorn-drawn wagon, and ecstatically leaping from his chair the first time he called in an airstrike on a herd of skunks. It's wonderfully crazy and I love it, if that's not painfully obvious by now. 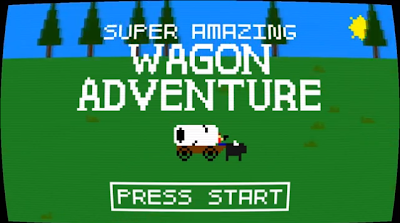 Super Amazing Wagon Adventure is an episodic shoot-em-up with semi-random structure. 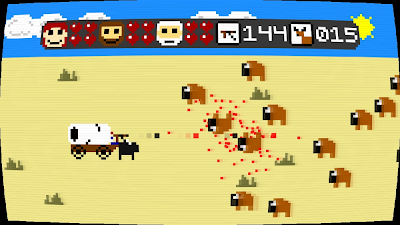 While your perilous journey will usually go in a particular order with certain incidents (like bandit attacks) there's a fair amount of twisting done by the game, so that it's very hard to get in the exact same situation twice in a hurry. Within ten minutes of starting up this game (and after at least three or four GAME OVERs) I had ran into a unicorn, and about an hour later (at a point which normally passed without incident) my settlers were killed by giant bees which made a nest in their ruined wagon. 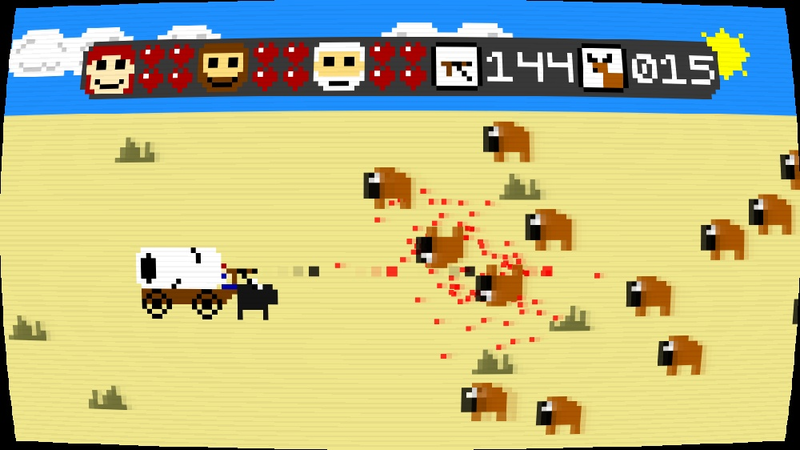 Super Amazing Wagon Adventure kills the hell out of your settlers. The three poor saps in the wagon get killed in wonderfully monstrous ways, all narrated by descriptive text that is often witty and regularly graphic. I lost one lady to her inner demons after she ate mushrooms, and a guy died of brain damage after being rammed by a gigantic buffalo on the great plains. 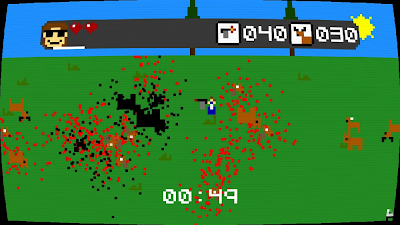 In true shoot-em-up form there are weapon upgrades aplenty! Energy beam weapons, rocket launchers which obliterate wildlife and deny the player their vital hides (for trade with fur traders who I'm actually surprised there isn't an option just to kill and eat) and a load more, topped off by the airstrike which flattens everything on the screen and (my personal favourite) a really neat flamethrower. There are different wagons to unlock, and different gameplay modes to spice things up if you ever get bored of the standard adventure mode (which I could easily play all day providing I had an IV of food and energy drinks plugged into a vein). 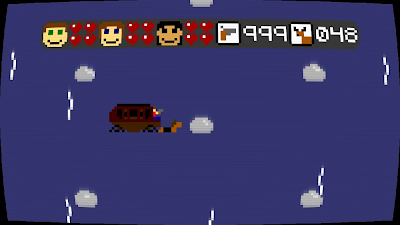 The "Losing Is Fun" feel of Dwarf Fortress is here in full effect - I've really relished in many (most) (okay, all) of my failures in Super Amazing Wagon Adventure. How could anyone get mad at this game? 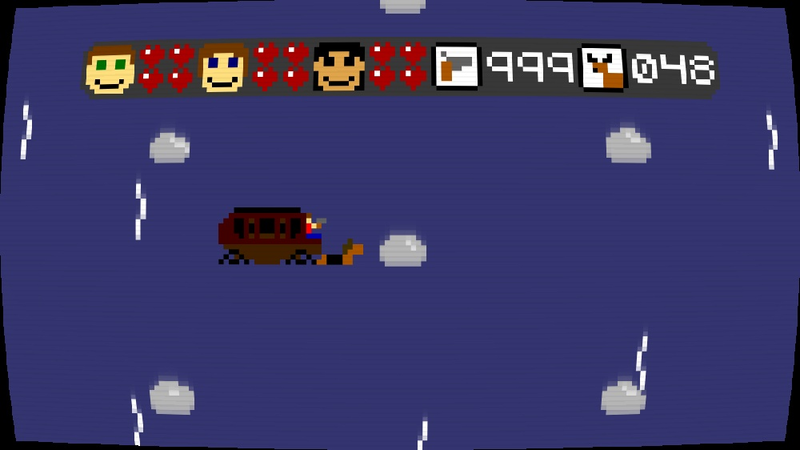 Its soundtrack alone is so upbeat you could use it to raise the dead. The difficulty I face with writing this review is that I'm so entranced and jazzed up by this game that I want to write down all the amazingly fun stuff that I've experienced with it, and it's a Herculean task not to just spill the beans and list everything I've seen and done, specifying which bits made me jump out of my chair with sheer glee. I don't want to ruin it for everyone. Saddle up, pilgrim. And watch out for giant spiders.